Whitten is 13 months old now!! He is getting so big so fast!! His favorite toy to play with is a ball. He loves kicking them. He puts the ball on the floor, backs up a couple of steps, runs up to it, and kicks it...left footed!!! My mom, my aunt, and my brother are all left handed, so I think Whitten is taking after them. He also eats with his left hand, which is another sign that he will probably be a "leftie"!! Here is a video clip of Whitten playing with his ball. Michael gets such a laugh out of Whitten's form and grunting noises!! Listen carefully and you can hear Whitten grunt with every kick!! It's too cute!! After the park, we played for awhile in the Grove. The boys must have played hard because they all took great naps once we got home!! Since Vaiden and Sims had naps today, we let them have a movie night. They climbed up in the fold out couch in the playroom with popcorn and watched "Space Buddies". They were so excited!! Angela and I cuddled up next to them...before long we were both napping...we must have played hard too!! Valentine's Day started off with Michael taking Vaiden and Sims to the local donut shop. They ate a ton of donut holes on their way home!! They also brought home some flowers for Angela and I--too sweet!! Vaiden and Sims were so proud of themselves!! Michael let them pick out the flower they wanted to buy. These are mine--I love them!! Angela and I had the boys Valentine t-shirts made. They all looked so cute in their t-shirts and jeans!! While Whitten was napping, Michael, Vaiden, Angela, Sims, and I made Valentine cookies!! The boys had so much fun and made the biggest mess!! They ate more dough than the actual cookies!! ~setting up the fire pit~Whitten wants to be SO BIG!!!! Vaiden had a great Valentine Party at school on Friday. Nana and Paw-Paw were in town to keep Whitten for the day (while we went to the Disney show) and were able to come to Vaiden's party. It was alot of fun!! The McDaniel's came to visit us for the long weekend and we had a great time!! We started the weekend off on Friday night. 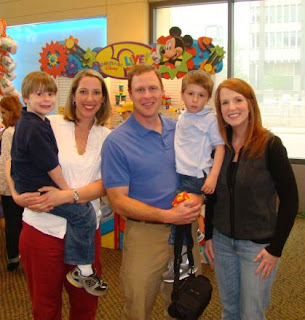 Michael, Angela, and I took Vaiden and Sims to Memphis to see Disney Live. It was such a fun night!! Vaiden was excited about the show, but didn't know what to expect. When Mickey Mouse came out on the stage in the first couple of minutes, he sat up straight and had such a look on his face. He was a little unsure that Mickey was walking around like a person. He soon got over it and really enjoyed the show. Vaiden and Sims danced and sang and when it was all over they wanted the show to start over. They had such a good time. Michael choose to go...yes he did have the option of staying home:) He had a great time also. He said that it was better than what he was expecting!! After the show, we had great dinner at Logan's and then headed home. Thanks again to my in-laws for keeping Whitten...we will have take him next year!! ~Vaiden singing and dancing~he loved it all!! The cake for the guests!! Whitten's smash cake Whitten enjoying his cake!! Whitten and his new car!! 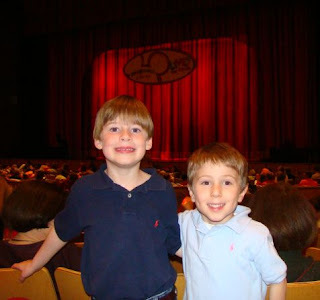 Michael and Joey have been friends since elementary school. Vaiden and Molly are only a couple of months apart in age and Whitten and Joe Reed are only a couple of months apart too!! Whitten had his first birthday party on Sunday at Nana and Paw Paw's house. Whitten LOVES balloons. He likes to wrap his legs around the balloons and just walk around..it's funny!! So the theme of his first birthday was Balloons!! The weather was so nice. The kids played outside all day. It is still hard to believe that my baby is a year old!! Michael surprised Whitten and I with a cake and balloons on our birthday. It was fun to watch Whitten tear into the cake...he loved it!! Michael took the day off and we drove up to Tennessee to have Whitten's pictures taken. We had lunch, then Michael took the boys to Bass Pro and let me enjoy the scrapbook store for an hour. We then drove to Target. Michael sat in the truck and caught up on some work things, with the sleeping boys, while I shopped. We then ended the day at Chuck E. Cheese!! The boys had a blast!! Vaiden didn't care much about winning the tickets, he just wanted to drive the cars. Whitten didn't care about anything but walking around the place. Chuck E. Cheese came out and talked to the kids...Vaiden hid under the table, while I took Whitten's picture with him. Although, he did stand to the electric CEC, but as you can tell from his body language, he didn't like him much either!! Anyway, we had a great day and the kids were worn out when we got home!! Whitten had a great first birthday!! !